Grade 310, combining excellent high temperature properties with good ductility and weld ability, is designed for high temperature service. It resists oxidation in continuous service at temperatures up to 1150°C provided reducing sulphur gases are not present. It is also used for intermittent service at temperatures up to 1040°C. Grade 310S (UNS S31008) is used when the application environment involves moist corrodents in a temperature range lower than that which is normally considered \"high temperature\" service. The lower carbon content of 310S does reduce its high temperature strength compared to 310.Like other austenitic grades these have excellent toughness, even down to cryogenic temperatures, although other grades are normally used in this environment. Grade 310L (and proprietary versions of this grade), is a 0.03% maximum carbon version of 310, sometimes used for very specific corrosive environments, such as urea production. TP310 or 310 stainless steel seamless pipe designed for elevated temperature operation features outstanding elevated temperature properties, favorable ductility, weldability as well as excellent resistance to oxidation. Commonly, it not only can be used for the continuous service at temperature reaching 1150℃, but also for intermittence service at the temperature up to 1040℃. Featuring low carbon content, grade310S or UNS S31008 stainless steel pipe is applied to the environment involving rust in a temperature range lower than the normally considered high temperature service. In addition, as a 0.03% maximum carbon version of 310, grade 310L is sometimes applied to extremely specific corrosive environments, for instance, urea production. All materials supplied by Aesteiron steel pipe will meet or exceed ASTM, ASME, ANSI and/or API standards, per your required specifications including full documentation. Tensile Strength (MPa ) min. Yield Strength 0.2% Proof (MPa ) min. Rockwell B (HR B) max. 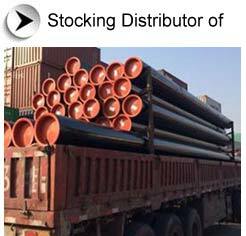 As an experienced TP310/310S/310L stainless steel seamless pipe manufacturer and supplier in China, Aesteiron steel pipes provides a wide range of products that includes boiler steel tube, JIS stainless steel tube, TP347/347H seamless stainless steel pipe, and more. 310 (UNS S31008) is the low carbon version of the alloy. It is utilized for ease of fabrication. 310H (UNS S31009) is a high carbon modification developed for enhanced creep resistance. In most instances the grain size and carbon content of the plate can meet both the 310S and 310H requirements.310L is the higher version of this grade. 310L is sometimes applied to extremely specific corrosive environments, for instance, urea production. A heat resisting stainless steel with high resistance to oxidation scaling and has high strength at elevated temperatures. This is combined with better creep properties at temperature and 310 stainless is very tough and ductile. 310 stainless has good resistance to oxidation and may be used in continuous service up to 1140ºC provided reducing sulphur gases are not present. With its high chromium content 310 stainless offers good corrosion resistance to increase high temperature properties.